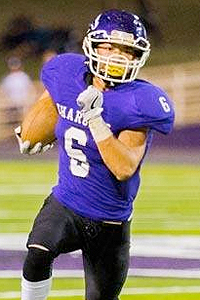 Austin Ewing proved that his stellar sophomore season wasn't a fluke. 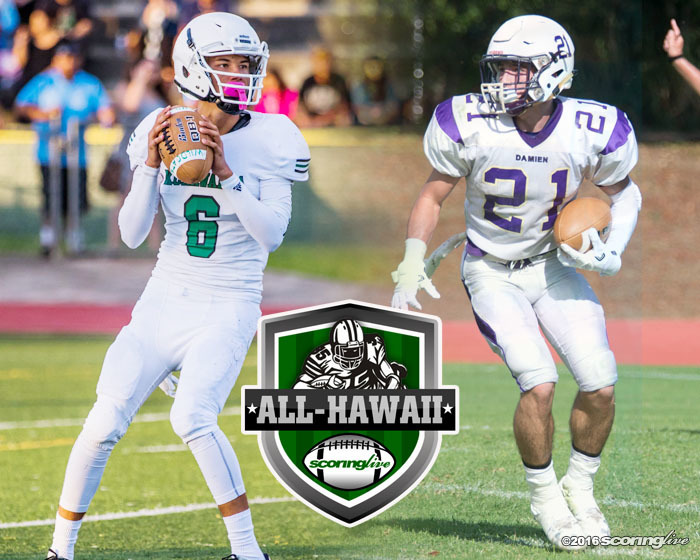 The junior gunslinger was chosen as the ScoringLive All-Hawaii Division II Offensive Player of the Year after leading the Konawaena Wildcats to back-to-back Big Island Interscholastic Federation titles and state semifinal appearances. 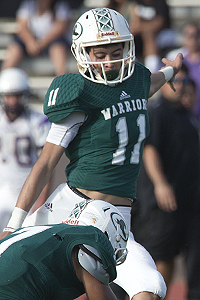 Ewing, who is 6-foot-1 tall and weighs 160 pounds, led all of Division II in every major passing category except for completion percentage, despite having just one starting receiver returning from a year ago. 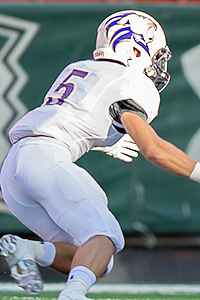 This season he completed 195 of 353 pass attempts for 2,688 yards and 32 scores through the air. 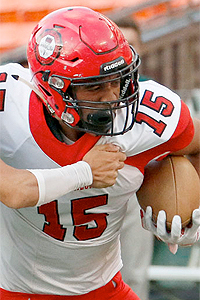 He also threw for four or more touchdowns in six straight games and spent most of the Wildcats' regular season games on the sidelines in the second half after building huge halftime leads. 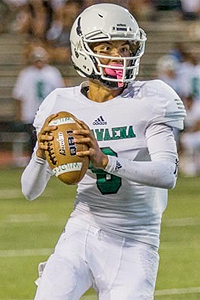 The junior quarterback had his best game of his career in a 35-12 regular season win over KS-Hawaii when he threw for 443 yards and four scores, which gave Konawaena home field advantage in the BIIF Division II championship game. 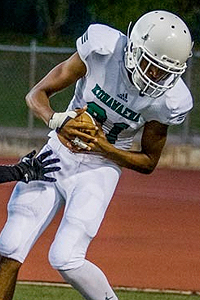 While he wasn't perfect by any means, having thrown multiple interceptions in Konawaena's first and last game of the season, he was always a point of emphasis for opposing defenses. 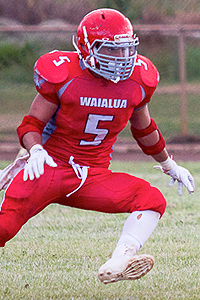 "He's a guy that you really really have to game plan against," said Lahainaluna co-head coach Garret Tihada. "He's just such a dynamic player that even if you pressure, he'll try to make things happen." While his numbers were nearly the same from a year ago, the biggest difference in Ewing's game was his maturity at the position. Unlike many young quarterbacks, Ewing looked to pass first — not run — when the pocket broke down. 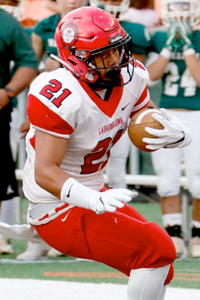 "I think the strongest point of him besides his athletic ability is that he just doesn't give up on a pass play," said Tihada. 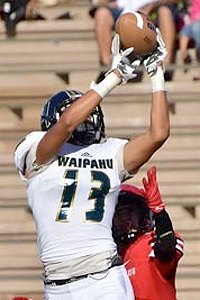 "He will try to scramble and wait for the receivers to get open. I think that's where he was most dangerous, on scrambles and broken plays." 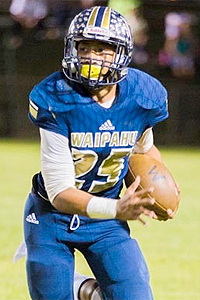 Waipahu freshman running back Alfred Failauga also received consideration for the award. The numbers do not lie when talking about Shawn Borges. 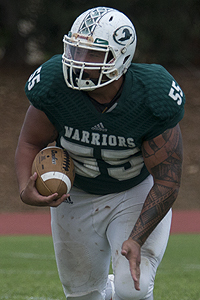 The 5-foot-11, 180-pound senior and two-time All-Hawaii Division II First Team selection led all of Division II in tackles and tackles for loss with 74 and 16 and 1/2 respectively, and is the ScoringLive All-Hawaii Division II Defensive Player of the Year. 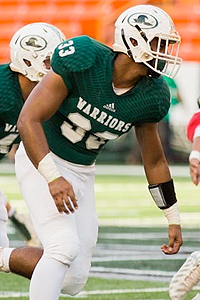 Borges also added seven sacks, three forced fumbles and three interceptions to help lead the Damien Monarchs to back-to-back Interscholastic League of Honolulu Division II titles and state tournament appearances. 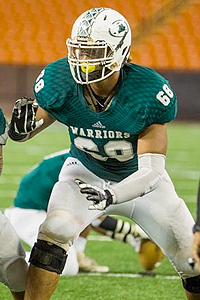 His best game of the season was in the Monarchs' final one of the year, a 21-14 loss to eventual state runner-up Kapaa in the Division II semifinals. 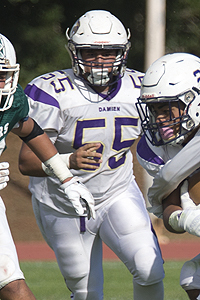 Damien trailed 21-0 at the half, but got a solid effort from Borges and its defense as it rallied to make it a one score game. 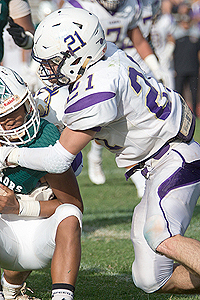 Borges did his part with a game-high 11 tackles and two tackles for loss. 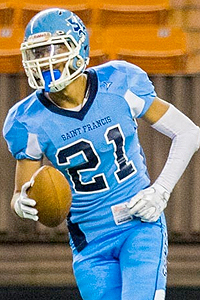 "He's just a true football player," said Saint Francis coach Kip Akana. 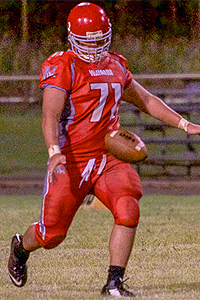 "He maybe undersized, but he always finds his way to the ball. He's very passionate on the field and he's earned our respect through the years. We expect to see him playing at the next level." Apart from his statistics, Borges was someone that always found a way to impact the game. 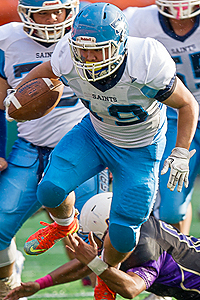 His presence on the field was so invaluable that his coaches even used him as a receiver and as a returner on special teams. If there was ever a moment where Borges was clutch in his career, it was in a 50-49 triple-overtime win over PAC-5 in the regular season. 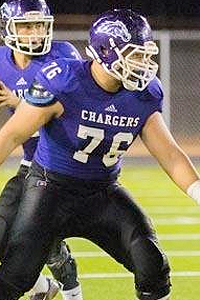 Borges, who had blocked three field goals in a single game as a junior, blocked what would have been the game-tying PAT against the Wolfpack to help ensure that the Monarchs would at least get a share of the league's regular season title. 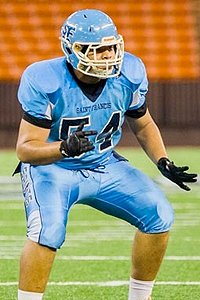 "Coaching against Borges the last two years has been challenging for us," said Akana. "You have to prepare for him wherever he's on the field. They line him up all over the place and you just got to know where he is. If you lose track of where he is, he'll make you pay." 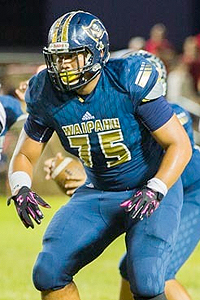 Kapaa defensive tackle Kapena Texeira also received consideration for the award. 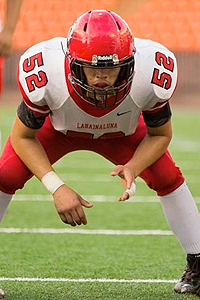 Lincoln Barit led the Waialua Bulldogs to new heights in 2016. 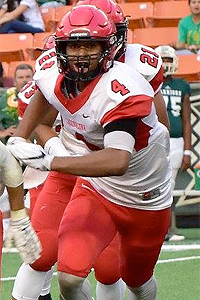 Despite losing over 20 seniors to graduation from a year ago, Waialua surpassed preseason expectations and made history by winning its first Oahu Interscholastic Association title in 61 years with a 36-35 win over Waipahu in the second-highest scoring OIA Division II championship game. 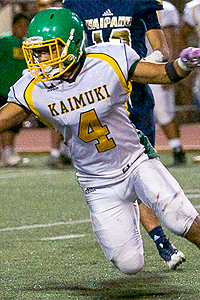 The last time the Bulldogs won the league title was in 1955, when it was part of a league called the Rural Oahu Interscholastic Association. 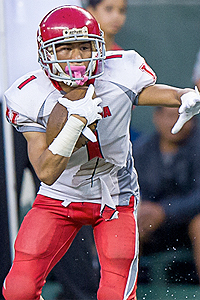 While it wasn't the team's first league title in program history, the OIA championship appearance also granted the Bulldogs their first-ever appearance into the Hawaii High School Athletic Association football state tournament.